Who Gets To Hang Out At The Pool? : Code Switch An ugly incident at a Texas pool party in which a police officer drew his gun on several unarmed black teenagers sits against a long history of racialized conflict over who can swim where. 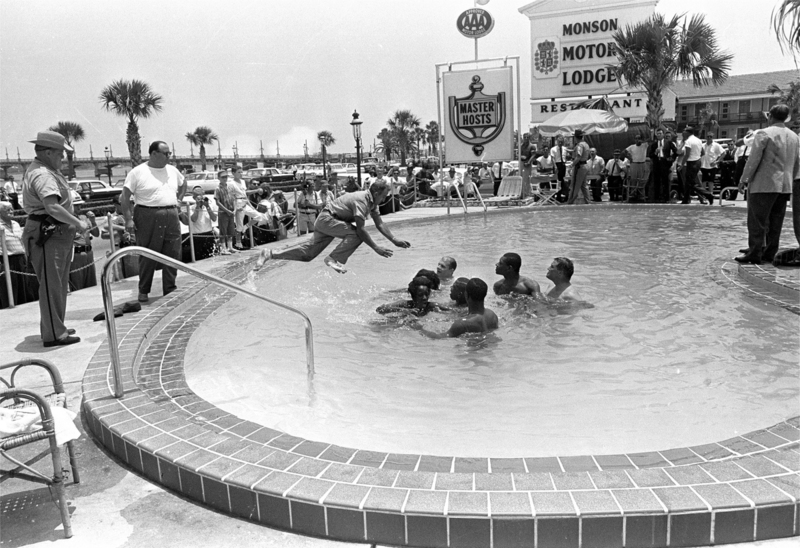 Protesters demonstrating in the swimming pool of the Monson Motor Lodge in St. Augustine, Fla., scream as motel manager James Brock dumps muriatic acid into the water on June 18, 1964. It was an ugly scene. A fight broke out at a pool party in a McKinney, Texas, subdivision on Friday, allegedly after a white resident told a group of black teenagers to "go back to their Section 8 housing." Local cops show up in force. At some point, a bystander pulls out his cellphone and begins videotaping. He catches one of the officers slamming a swimsuit-clad 15-year-old girl to the ground and pointing his gun at unarmed teen boys who appeared to rush to her defense. The video has gone viral, the officer who drew his gun has been placed on administrative leave, and details about exactly what happened Friday afternoon are still coming out. But as others have noted, this story brings up a decades-old American drama around race and swimming pools, featuring racial gatekeepers who opted to privatize public spaces rather than integrate them. It's worth revisiting that history as we try to make sense of McKinney. Jeff Wiltse, the author of the book Contested Waters, told NPR in 2007 that the early 20th century saw a boom in public swimming pools, which were originally intended for bathing and hygiene. These new municipal pools were enormously popular, but they were separated by gender over fears of sexual impropriety. And like so many other public resources, these new pools were concentrated in white neighborhoods. This story brings up a decades-old American drama around race and swimming pools. But those big public pools eventually became mixed-gender pools, unleashing even deeper-seated fears about what might happen if black men and white women went swimming together. "Whites in many cases literally beat blacks out of the water at gender-integrated pools because they would not permit black men to interact with white women at such intimate public spaces," Wiltse writes. "Thus, municipal pools in the North continued to be intensely contested after 1920, but the lines of social division shifted from class and gender to race." 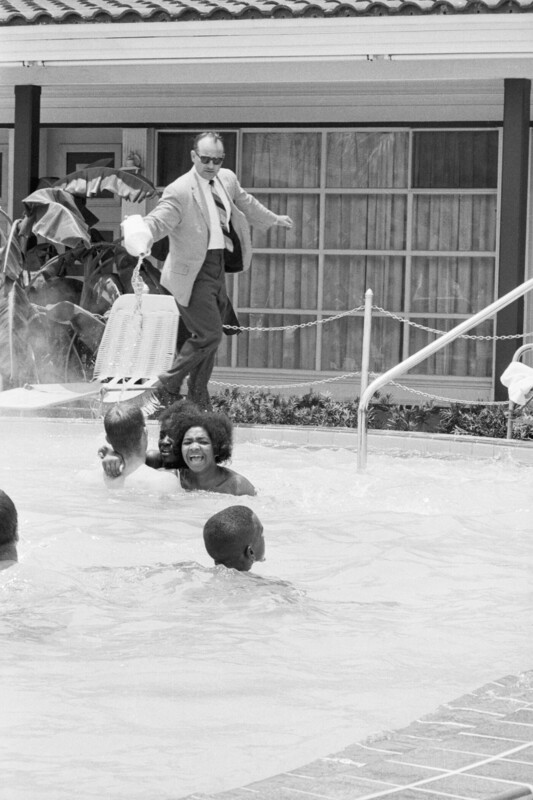 Campaigns by civil rights groups like the NAACP to integrate public pools often turned very, very ugly. "Groups for and against segregation threw rocks and tomatoes at one another, swung bats and fists, and even stabbed and shot at each other," Wiltse wrote. "Before 1950, Americans went swimming as often as they went to the movies, but they did so in public pools. There were relatively few club pools, and private pools were markers of extraordinary wealth. Over the next half-century, though, the number of private in-ground pools increased from roughly 2,500 to more than four million. The declining cost of pool construction, improved technology, and suburbanization all played important roles. But then, so did desegregation." Appelbaum points to Marshall, Texas, where 95 percent of local residents voted in 1957 to have the city sell off its recreational facilities; the pool's new private owners reopened it as a whites-only space. When the group of white and black integrationists refused to leave the motel's pool, this man dived in and cleared them out. All were arrested. It was during one of these fights that the famous photograph at the top of this post was taken. It shows James Brock, a motel manager in St. Augustine, Fla., pouring muriatic acid into a pool filled with black kids who were participating in a protest against whites-only pools. J.T. Johnson and Al Lingo, two of those protesters, talked with StoryCorps last year about that moment.
" 'Everybody was kind of caught off guard,' J.T. says.
" 'The girls, they were most frightened, and we moved to the center of the pool,' Al says.
" 'I tried to calm the gang down. I knew that there was too much water for that acid to do anything,' J.T. says. 'When they drug us out in bathing suits and they carried us out to the jail, they wouldn't feed me because they said I didn't have on any clothes. I said, "Well, that's the way you locked me up!" ' "
Wiltse theorized that the disproportionate number of black Americans who can't swim and are more likely to drown is in part due to this historical lack of access to regular places to swim. Once white folks fled to the suburbs and built their own pools, he explains, public pools fell into disrepair and began closing. "As a result of that pattern of discrimination, swimming did not really become a significant part of ... black culture," he told NPR's Michel Martin back in 2007. Because swimming never took root in black communities, he said, fixing swimming pools was not much of a priority when black politicians began winning elective office in the 1960s and 1970s. Which brings us back to the incident in McKinney, Texas. The details about what happened on Friday are still coming out: who lived in the neighborhood, who was just visiting, to what extent it matters. But as Appelbaum and others have been saying, it's important to remember that the rise of private swimming spaces like this one is all tangled up in attempts to desegregate public ones.